Editor’s Note: This is a free preview of one of our premium NFL DFS strategy articles from last season covering evergreen DFS topics. To read more content like this and access our research tools join us at DailyRoto premium this fall. Still a few sleeps away from Week 1 and as of this writing the NFL hype machine has already been cranking for a few weeks and about to get dialed up another notch between now and Sunday. The early weeks of NFL can be the best of times and the worst of times as we try to learn what we can from offseason news, personnel and coaching changes, and vanilla scheme preseason games and employ it in a better way than the rest of the DFS community. I still remember licking my chops heading into the 2014 season ready to stream QBs against the porous Dallas Cowboys secondary until an improved offensive line and focused running attack headlined by a career year from DeMarco Murray saw them improve from the WOAT to a middling unit versus the pass from a Fantasy perspective. 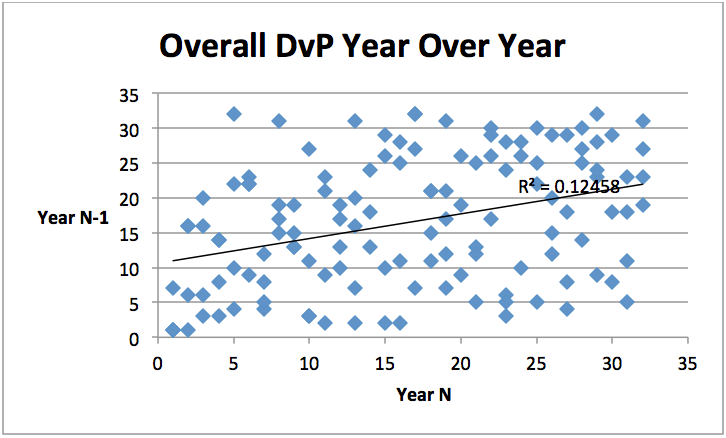 In this article we’ll be exploring the risks and benefits of leveraging prior years’ defense vs. position (DvP) rankings in our early season matchup analysis. I’ve linked to some tables with the raw rankings data at the end so you can dive in team by team as you see fit, but for my general approach what I’ve done is plot out the rankings data with different years on the X and Y axis – if the rankings held perfectly true we’d expect to see a linear trend up to the right with the #1 ranked team remaining #1 and #32 remaining #32, and if they were completely random we’d probably see something close to a horizontal trend line. 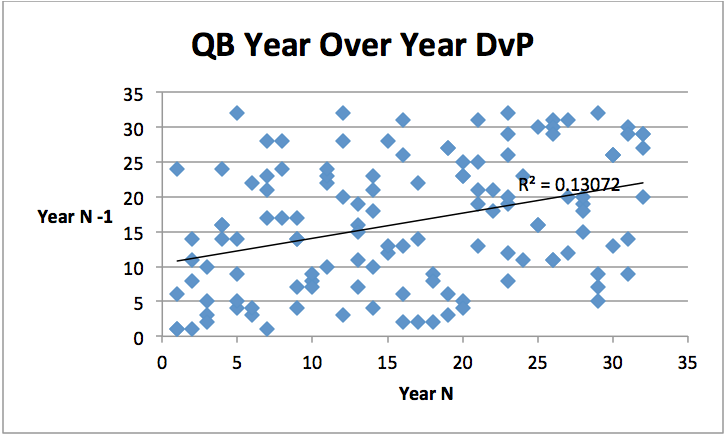 To do this I gathered 2011 to 2015 DvP rankings and plotted each year’s ranking on the x-axis with the prior year’s ranking on the y-axis, allowing us to see how the rankings correlated. In aggregate we do see a correlation between DvP on a year over year basis, but by viewing the changes on a scatterplot we’re able to more effectively visualize what changes happen – the teams on the top left are defenses that went from poor to elite, and the bottom right went from elite to poor, while there are definitely clusters of teams making only marginal improvements. The big takeaway for me was that in aggregate it is still rare for teams to make extreme leaps but a lot more frequent that they can make enough adjustments to become a competitive unit, but I wanted to also look at positional impact. Want to read more great content like this? Join us with DailyRoto Premium NFL this fall! So I started off thinking I’d analyze these positions individually but when the results came in it made more sense to pull it into the same section. Quarterbacks ended up being slightly more correlated than our aggregate rankings leading me to believe that teams had a harder time adjusting to “the passing attack” until I took a closer look at Wide Receivers and Tight Ends. When looking at that 56% of teams move at least 5 spots in their QB rankings and 31% move more than 10 spots, but for wide receivers 73% move at least 5 spots in their QB rankings and 41% move more than 10 spots. So if QB rankings are more predictive and consistent year over year but their complementary partners are not what could be causing that? 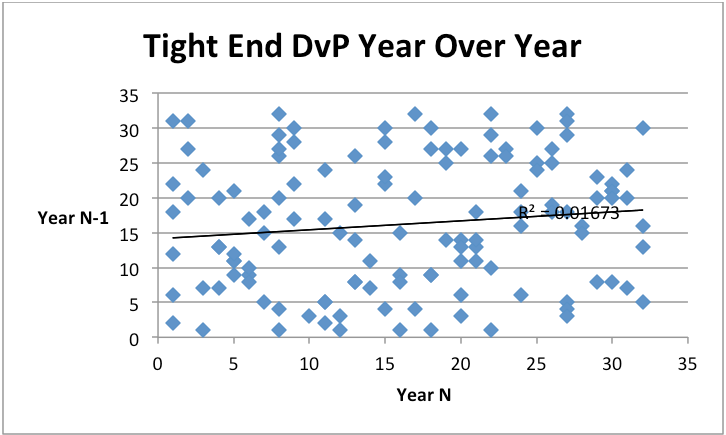 One hypothesis is that the teams are still allowing the same performance but the targets are getting redistributed between tight ends and wide receivers showing that maybe those specific positions aren’t as predictive and should be look at together. The other hypothesis ties back into some other industry articles I’ve read outlining that Vegas odds are less predictive for wide-receivers, and is that wide receivers can accrue a higher % of their fantasy points from catches and yardage, which normalizes more between the top and bottom NFL teams in a given year, causing more randomness in the rankings. 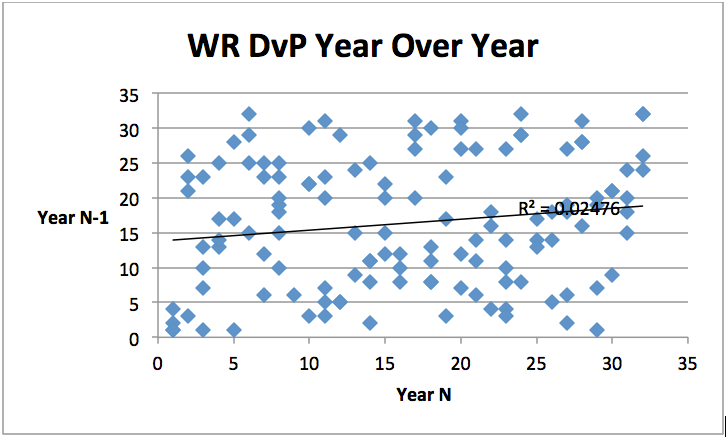 Regardless, it seems like leaning heavily on wide receiver DvP from prior seasons may be a leak.